Darin Erstad - Short-lived record holder? Late in the 2000 season, Darin Erstad made a valiant run at the all-time single season hits record in Major League Baseball. Every night, fans hoped that their local broadcast would break into the Anaheim Angels' game with news of Erstad's pursuit of Wade Boggs' 15 year-old record of 240 hits. 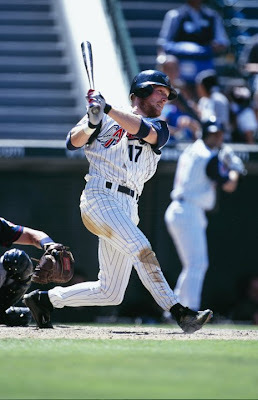 In his first at bat on the final day of the 2000 season, Erstad ripped a double to left field, tying Boggs. He ended up going 1-for-5 on the day, leaving him in that tie, and he would only share the record with Boggs for a year until Ichiro Suziki reached 242 base hits one season later. Are you scratching your head, wondering why it is that you don't remember those momentous nights 13 seasons ago? You shouldn't, because they didn't actually play out that way. Unfortunately, baseball's record book is larded up with irrelevant and inflated stats and numbers from bygone eras where the game was profoundly different, and certainly of far inferior quality. To be a baseball fan, is to be indoctrinated with a reverence for the most cherished numbers from the history of the game. Part of the romance of those statistics is to imagine that the game was so perfect and the rules so similar across the decades that you could place Ty Cobb or Babe Ruth on a field with Ken Griffey and Cal Ripken Jr., and their skills would play right alongside one another. That they could walk shoulder to shoulder as the very greatest of the game. It's this affection for the misty memories of a past that came well before most of our time that leads to people defending the sanctity of the record book, and creating some of the more poisonous instincts in baseball's traditionalists. People long for the days of Joltin' Joe DiMaggio, and his 56-game hit streak. Or Ted Williams' .406 batting average. Or Babe Ruth's 60-homer season. At the same time, the more recent single-season achievements - especially when it comes to home runs - are discounted or dismissed entirely because the entire "steroid era" is under suspicion by self-appointed arbiters of history. As those types increasingly use - or withhold - their Hall of Fame votes to make the case that baseball has lost something of its purity and sportsmanship, it increasingly bothers me that baseball's record book and highest honours are being overrepresented by those who played in the most shameful era in the game's history, the Segregated Era. Major League Baseball goes to some lengths to celebrate Jackie Robinson, and the eventual integration of the game. But it also glosses over the fact that some of the bygone greats piled up their achievements in leagues that were systematically racist, creating less competition for the players in that era. Does DiMaggio's hitting streak reach 56 games if the American League was integrated at the time? We'll never know, but we should never forget that pre-1947 numbers should always be regarded with a healthy dose of suspicion. You can have as many Jackie Robinson nights as you want, and you can retire his jersey number across the game, but all of that comes off as empty sentiment when you allow the records set in a game that was unbalanced and unfair because of systematic and deliberate racism to stand. I suppose it's possible to defend the individual players from that era, and say that they weren't actively racist and that their records still deserve recognition. But in doing that, it actively obscures the historical nature of the achievements of players from the more modern era. When Ichiro eventually broke the single season hits record in 2004, it would have been nice to recognize the players he passed on the list who had posted incredible seasons in their own right. Boggs and Erstad and Carew, as well as Don Mattingly's 238 hits in 1986, or Kirby Puckett's 234 in 1988, or even Stan Musial's 230 in 1948, a year after the start of baseball integration. Instead, those achievements took a backseat to totals from George Sisler or Lefty O'Doul. And while I'm sure that there are some who would step forth to defend their legacies, the preservation of the records from that era creates a record book which is less meaningful to current fans. And it's not as though this is without precedent. The pitching stats and records from the "dead-ball" era are still preserved in so much as we can still locate them if we need to, but they are generally set aside from those in the "live-ball" era, which began in 1920. And one could argue that the distinction between those two eras is not as notable as the one between segregated baseball and integrated baseball. Currently, the single season records for runs, doubles, runs batted in, and total bases all rest in the hands of segregated era players. But wouldn't it be more meaningful for current day fans to recognize Jeff Bagwell's integrated era record of 152 runs scored? Or Manny Ramirez's RBI record of 165? As Blue Jays fans, we would remember Carlos Delgado's 2000 season especially fondly if we were to recall the summer in which he and Todd Helton made their run at the MLB record for doubles, with Helton's 59 still topping Delgado's 57 as the two top marks in that offensive category. It's nice to think of baseball's vast history, and to acknowledge how the game has changed or evolved over the years. But some of the truly great performances of the past 30 years are not given their proper due when they are buried among the numbers of the segregated era. Coming to this late, but I'm assuming yr familiar with Chris Rock's comments on "affirmative action home runs"?